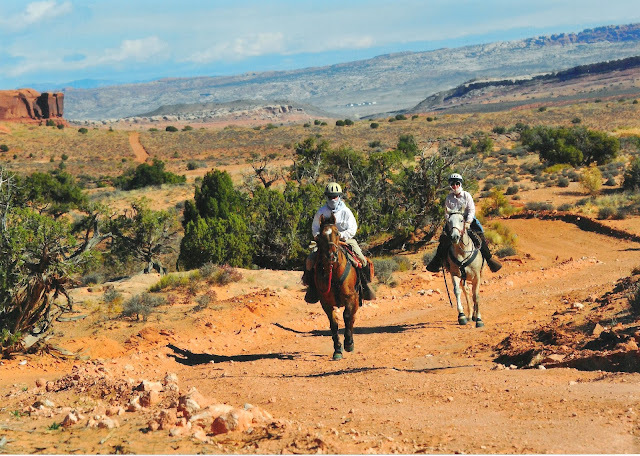 We returned to the 3 day Moab Canyons Endurance Ride for the second year in a row. Above is an action shot from last year, (photo by Vicki Gaebe at VRG Enterprises), since I didn't have time to take photos on this year's ride. Last year, I rode Coco and Steve rode Boss. This year, I rode Boss on Day 1. Since he's a quarter horse, he shouldn't be as good at endurance as Coco, who's an Anglo Arab. We hoped to even up the score by having Boss carry less weight. Boss is a handful for me. He's always wanting to get ahead. We rode behind my blog friend Merri at first. She and her fellow rider Steph have many years of experience, so following their lead seemed wise. However, Boss was very unhappy with being behind. Eventually, I let him pass, hoping he would calm down. Not so. He immediately pricked his ears at a horse a half mile ahead and was determined to catch up with that horse. He's a competitor, for sure. And nobody told him quarter horses aren't supposed to be good at endurance! He did just fine. Although we didn't go particularly fast, we completed our 30 miles and had a fun time. Above is a photo of a ride start, with all the excitement amid flying hoofs and swirls of dust. We skipped the competition on Day 2 and had our own fun ride instead. More about that adventure later. On Day 3, Steve rode Boss, while Coco and I stayed at ride camp. Coco was sad to be left behind. He seemed to be favoring one foot, though, so letting him rest seemed best. Daisy was with us, and she had the finest time of all. There must've been 50 dogs in camp, and she played with all of them! Here's Steve coming in to the finish line with Boss. They were in second place! They walked down the final hill so Boss could catch his breath before his pulse was checked at the race's end. A horse has to drop his pulse to 60 within 30 minutes of crossing the finish line, or he will be disqualified. Boss dropped to 60 in about 7 minutes, easily meeting criteria. Overall, we learned a lot from more experienced riders, had lots of fun, and exhausted ourselves thoroughly. All good. Getting home to showers and a real bed after 3 days of sleeping in the trailer was pretty great, too! Loved reading about your adventure. Boss & my Bob must have some of the same genes! Looks like you had good weather. Congrats to all of you and applause for Steve and Boss. This sounds as if it was an exciting three-day adventure. I didn't realize Boss was so competitive. Are you sure he knows he's a quarter horse? It's entirely possible that Boss has the large heart gene -- have you heard of it? Mostly in TBs but since almost all QHs have TB blood in them they can have it too. That sounded like an exciting event Janie, and very interesting to learn about your horses personalities. It looks like great fun. Cool that Steve walked his horse in. I love how you guys take care of the animals. I'm glad that Daisy had fun also. What an adventure. Second place is amazing! Congratulations to Steve and Boss! Beautiful scenery for the ride. Second place in the second year is great. I think they are both endurance horses. I think you know I am not a horse person but this sounds really fun. I vaguely remember it from last year. Well done Steve and Boss, your both second to none here in blogland. Boss is 'da Bomb! What a great event for you both and the critters....so glad Daisy didn't miss out of any fun! Sounds like a great adventure for the five of you (Steve, Janie, Boss, Coco and Daisy). Congrats to Steve for coming in second! woohoo! way to go Steve and Boss!